In Round 3 smaller businesses with at least 10 FTEs or turnover >$500,000 are encouraged to apply for an Early Stage Feasibility and Testing voucher and/or a Research & Development voucher. 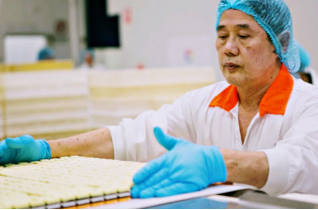 This recognises the smaller businesses in the food value chain that require support, particularly for R&D and early stage works that would otherwise be omitted under the general eligibility criteria. Applicants are encouraged to consider the Victorian Government’s Healthy Choices guidelines. Projects that increase the nutrient rating of foods, reformulate a product’s size, design a product for healthy fresh vending or otherwise increase the supply of healthier foods, would be considered favourably. Vouchers can be used to access facilities, services, advice or expertise from Registered Service Providers. There are three voucher types. For a problem that needs an innovative solution. • identifying and mapping pathways between businesses and innovation service providers (e.g. a research institute). Applicant is required to contribute at least one hour of time in-kind for every $1000 of voucher funds. For applied research projects with an innovation service provider. • small volume production to test commercial viability of new hardware, technology or products. Suitable for emerging projects from the early stage feasibility voucher. Applicant is required to co-contribute at least 1:1 in cash. To increase investment into the food and agriculture sector by supporting businesses to become “investor ready” and attractive to investors. 3. Development of prospectus materials to assist in delivering the pitch or proposition to the investor. Applicant is required to co-contribute at least 1:1 in cash. How do I apply for a Food Innovation Voucher? Round 3 of the Food Innovation Vouchers opened on 25 March 2019. More information can be found on the Business Victoria website.